The White Ghost by James R. Benn: Synopsis and Online Purchase Options. 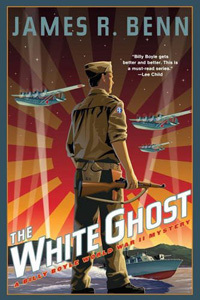 Synopsis (from the publisher): 1943: In the midst of the brutal, hard-fought Solomon Islands campaign between the Allies and the Japanese forces, Lieutenant Billy Boyle receives an odd assignment: he's sent by the powerful Kennedy family to investigate a murder in which PT skipper (and future president) Jack Kennedy has been implicated. The victim is a native coastwatcher, an allied intelligence operative, whom Kennedy discovered on the island of Tulagi with his head bashed in. That's Kennedy's story, anyhow. Kennedy was recovering in the Navy hospital on the island after the sinking of his PT-109 motor torpedo boat. The military hasn't decided yet whether to make him a hero for surviving the attack, or have him court-martialed for losing the boat, and the last thing the Kennedy clan wants is a murder charge hanging over his head. Billy knows firsthand that he shouldn't trust Jack: the man is a charmer, a womanizer, and, when it suits his needs, a liar. But would he kill someone in cold blood? And if so, why? The first murder is followed by two more, and to find the killer, Billy must sort through a tangled, shifting web of motives and identities, even as combat rages all around him.